Straight, Ai's sculpture made from 150 tonnes of recovered steel rebar, is arranged to create a sombre rolling landscape. Photo courtesy of Art Gallery of Ontario. 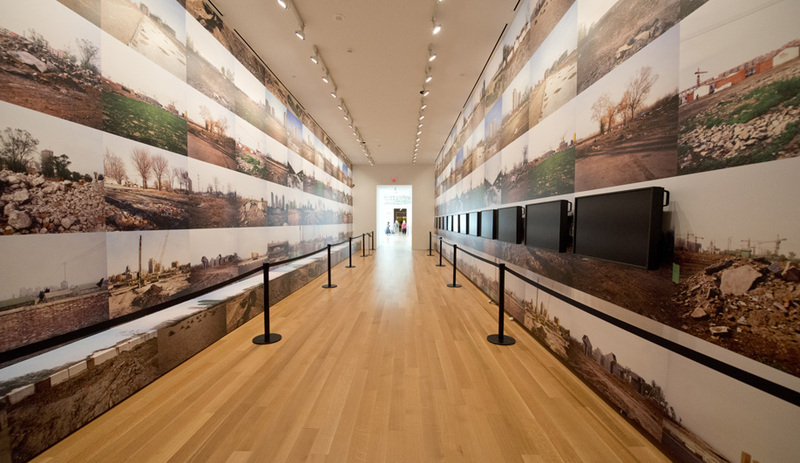 Ai Weiwei's Provisional Landscapes captures the real estate development in Shanghai, Beijing and the Dongbei region. Photo by Keith Beaty/Toronto Star. 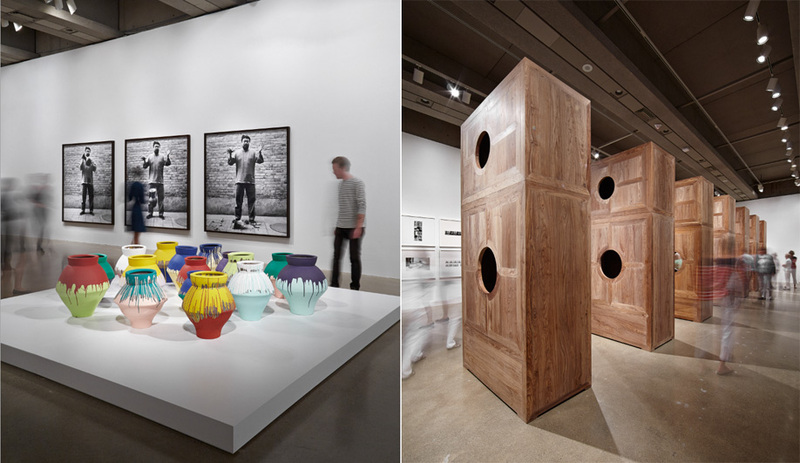 Left: Ai Weiwei's Coloured Vases. Right: Ai's Moon Chest. Photos courtesy of Art Gallery of Ontario. 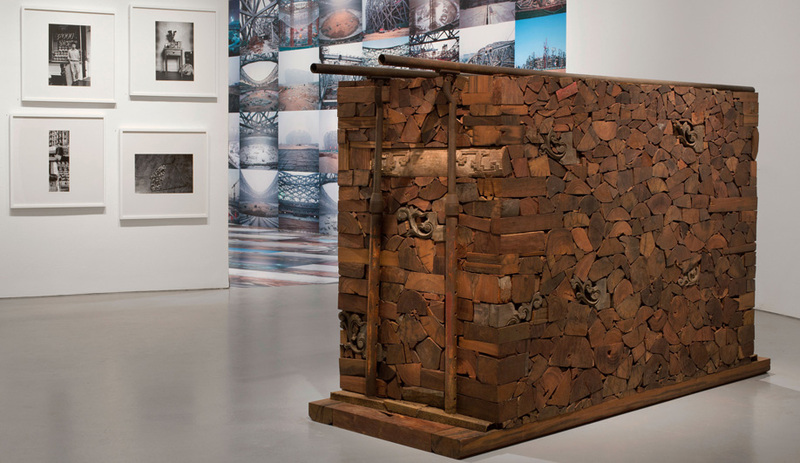 Ai Weiwei's Moon Chests, seven hollowed wooden chests lined up on a curve. Photo by Keith Beaty/Toronto Star. 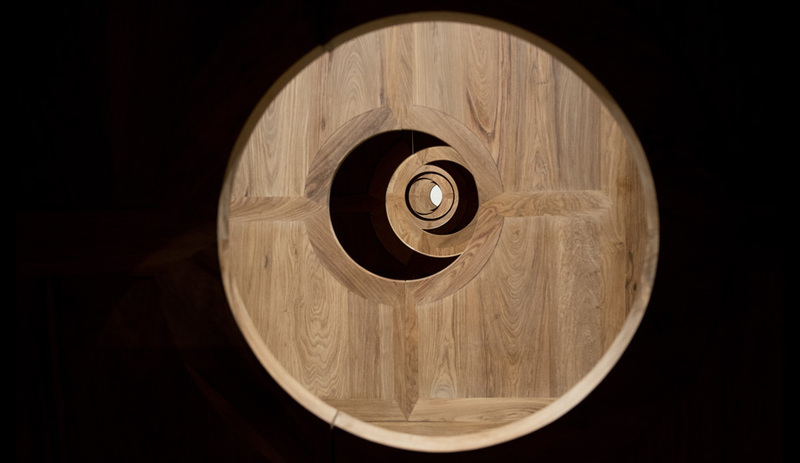 Photos of the Bird's Nest under construction and Divina Proportione, two sculptures made from Huali wood without nails or screws. 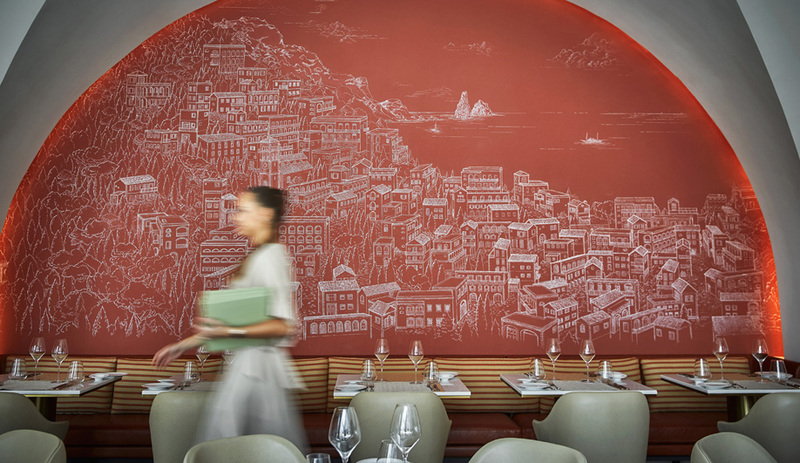 Photo courtesy of Art Gallery of Ontario. Ai Weiwei's Kippe sculpture. Photo courtesy of Art Gallery of Ontario. Left to right: Ai Weiwei's Grapes, photographs taken in New York and Ai's Teahouse trio. Photo courtesy of Art Gallery of Ontario. 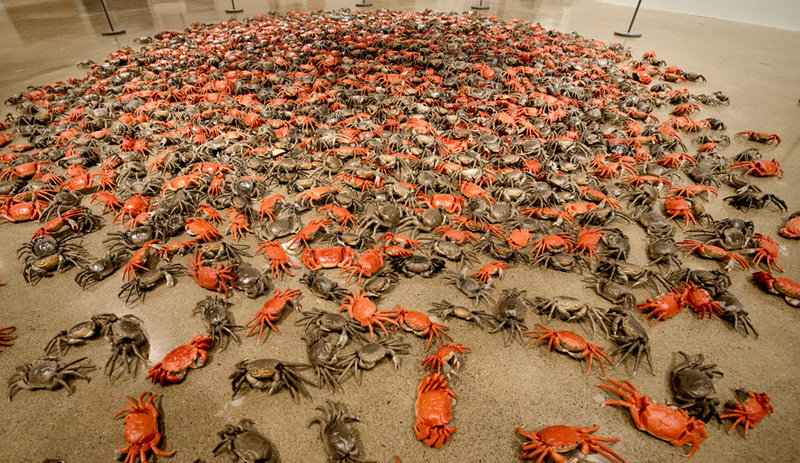 He Xie, a heaping pile of porcelain crabs, by Ai Weiwei. Photo by Keith Beaty/Toronto Star. 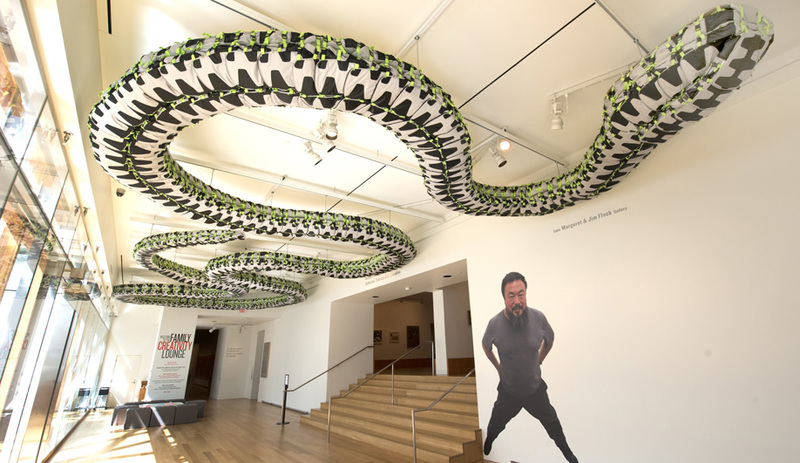 Ai Weiwei's Snake Ceiling, a sinuous composition made up of hundreds of backpacks latched together. Photo by Keith Beaty/Toronto Star. 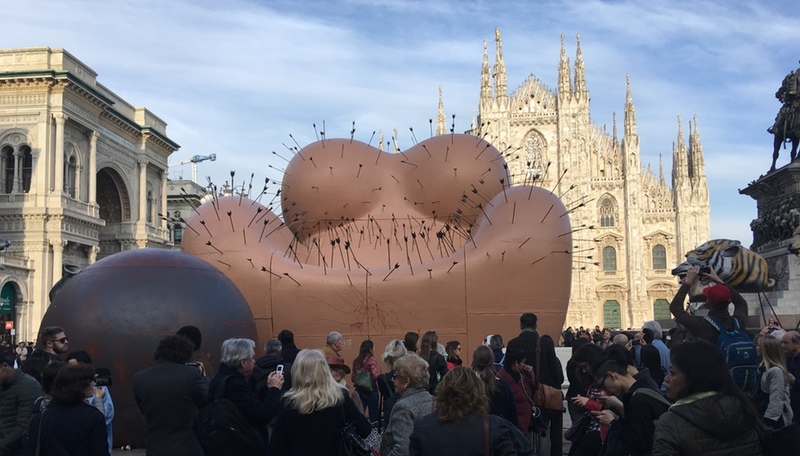 Revered for courting controversy, taunting authorities and inspiring millions as much as he is for his art, the Chinese artist is the subject of According to What?, a globe-trotting exhibit that’s just landed in Toronto. Ai Weiwei gained international acclaim in 2008 with the Beijing National Stadium, also known as the Bird’s Nest, a collaboration with Herzog & de Meuron. He later publicly regretted the project, citing its use – and the city’s staging of the Olympic Games – as propaganda for China’s ruling regime. 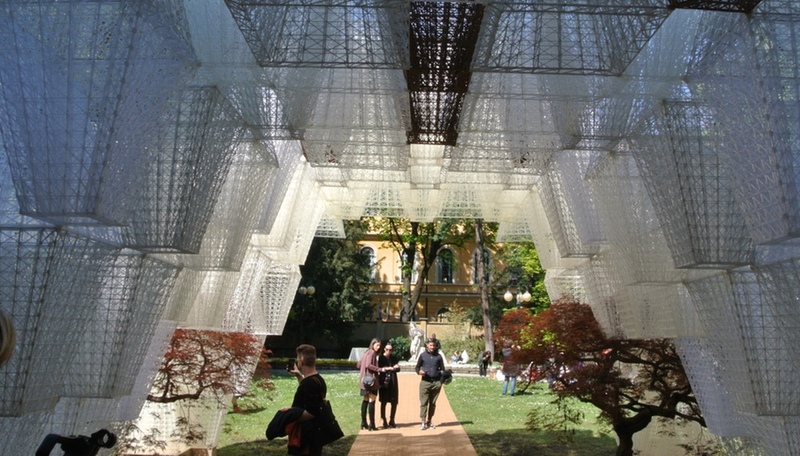 But the project remains cemented among Ai’s repertoire of ingeniously conceptualized works. 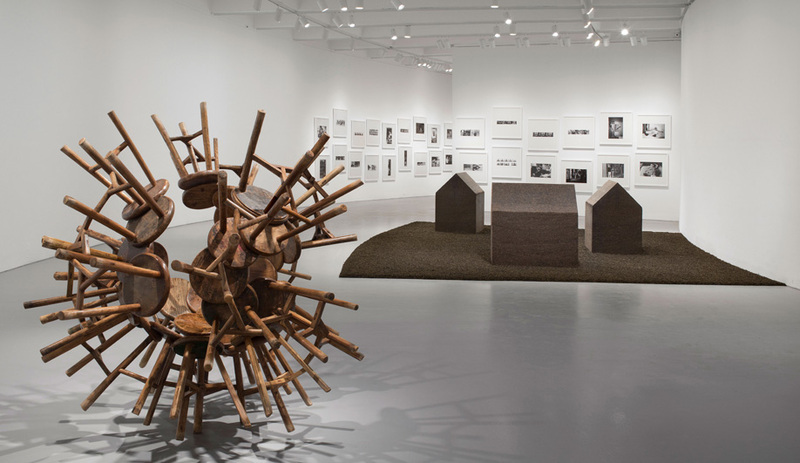 The Art Gallery of Ontario hosts the only Canadian stop on the globe-trotting route of Ai Weiwei: According to What?, an exhibit of photography and installations first staged four years ago at the Mori Art Museum in Tokyo. 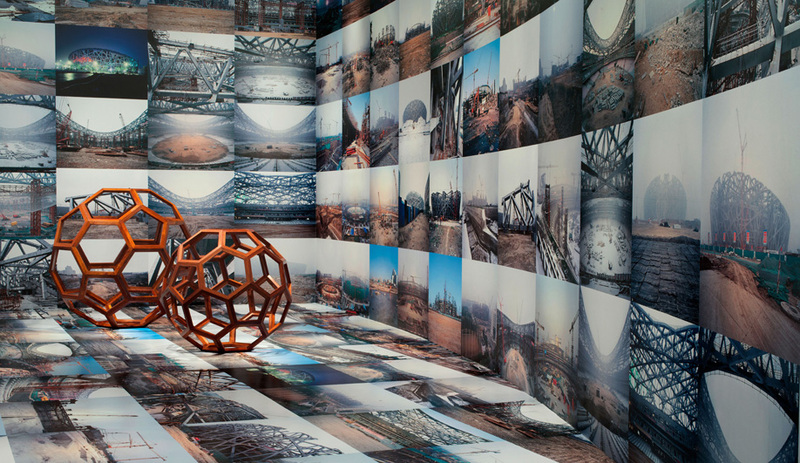 The show, which runs at the AGO until October 27, features large-scale shots of the Bird’s Nest in construction, part of a growing documentation of the changing built fabric of Chinese cities. A separate display, called Provisional Landscapes, covers the walls and a long bench in a corridor-like space with Ai’s snapshots of the frenzy of development in Shanghai, Beijing and the Dongbei region. Steps away, his haunting images of the 2008 Sichuan earthquake, where poorly built (or “tofu-dreg”) schoolhouses caved in and buried thousands of children, bring to the fore his biggest project to date: social activism as an art form. A number of installations are inspired by Ai’s “citizen investigation” into the earthquake’s victims. 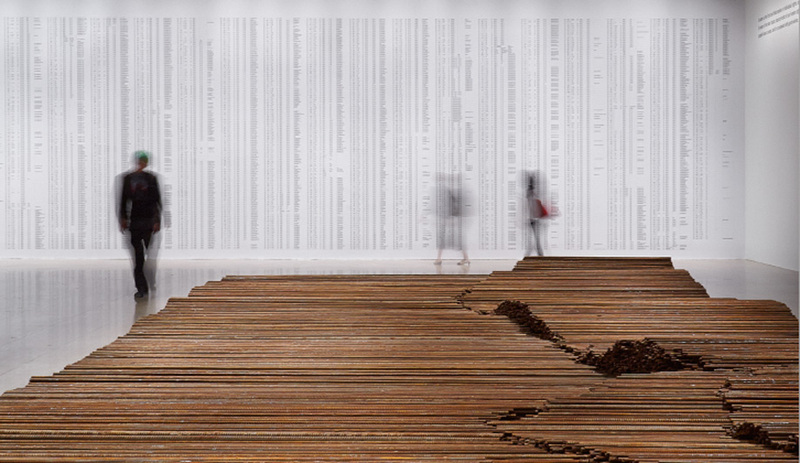 For Straight, Ai had 150 tonnes of steel rebar recovered from the sites of the collapsed schools straightened, then he arranged them in stacks to create a sombre rolling landscape. He and several volunteers embarked on creating an Excel document that lists the names, birth dates, genders and grades of the more than 5,000 school children who died – and an enlargement of that heartbreaking document covers a wall in the gallery. Perhaps the most compelling of the pieces, however, is Snake Ceiling, a sinuous composition made up of hundreds of backpacks latched together to stand in for those left behind after the quake. Other works on display include the Colored Vases, millennia-old urns coated with industrial paint in pop art hues; Grapes, a gravity-defying assemblage of 40 Qing Dynasty stools; Moon Chests, seven hollowed wooden chests lined up on a curve; and He Xie, a heaping pile of porcelain crabs. Besides the Toronto show (and the installation of his Zodiac Heads at the city’s Nathan Phillips Square), fans of Ai’s can check out Baby Formula, on at Michael Janssen Singapore gallery until October 6. The installation – 1,815 cans of baby formula that form a map of China – draws attention to the tragedy, also in 2008, that saw six infants die and 300,000 fall ill after consuming melamine-laced milk. Notably absent from both exhibits is Ai Weiwei. Following the artist’s 81-day detention in 2011 – without an official charge – his design firm, Beijing Fake Cultural Development, was prosecuted for tax evasion. At his Beijing home, the 56-year-old is under constant government surveillance and is prohibited from leaving the country. Last May, he released Dumbass, a heavy metal song and music video inspired by his 2011 detention, and despite the Chinese regime’s efforts to keep him from interacting with the outside world, he communicates to over 200,000 followers on Twitter throughout the day (follow him at @aiww). On September 5, Ai will join the AGO director and CEO, Matthew Teitelbaum, for a live chat.